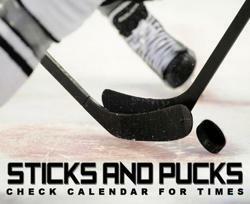 Sticks & Pucks is for all ages looking to have fun or work on their skills. Sticks & Pucks is different than drop-in hockey in that there are no organized games and full equipment is not required. Skaters are free to work on whatever skill they want whether it be passing, shooting or just skating with the puck. Please check the calendar for precise times and dates.